Home » 25 Days of Giving: Brooklyn Bedding Giveaway! It’s the penultimate day of our 25 Days of Giving extravaganza, and we’re marking it with a special new giveaway from Brooklyn Bedding! While Brooklyn Bedding has a variety of different mattresses in its collection, this giveaway is focusing specifically on its latest offering: the Bloom Hybrid, an eco-friendly hybrid model. I think the Zenhaven is my favorite Latex mattress. What a marvelous giveaway! Thank you for the opportunity to win such a great mattress. Oh yes would be a dream come true to win this! I have to say after reading the reviews on all the different ones I would choose the Bloom Hybrid. Thanks so much for all the detail on all of them to help me choose what would be best for a good nights sleep. Thr Zenhaven is my favorite, but honestly any of these mattresses would be a huge improvement over my current mattress. So many great mattresses, hard to choose just one. But I really liked the Zenhaven! It is time for a new mattress. A nice comfortable bed = great nice of sleep. I’d really appreciate winning this prize! My favorite latex mattress is still Zenhaven. Happy New Year! All of these look comfortable, but the DreamCloud is my favorite. They all look great but I think I like the Bloom Hybrid. This mattress looks so nice! Thank you for the reviews! This is one of the 10 best . I really like the Zenhaven, but I’m finding other mattresses that would work just as well for me & the hubby. Love watching, and reading your reviews! I’m learning a lot! Thanks so much!!! The Zenhaven is my favorite LATEX mattress, but there are plenty of other great mattresses for side sleepers! I’m still learning, and having fun doing it too!!! Thanks for the great reviews!!! The Bloom is one of my favorites. It looks so comfortable. The Zenhaven sounds like an amazing side sleeper bed for me. Hope to win. What is the size of the mattress the winner receives? I can’t find the rules page. It’s unbelievable all the mattress contests I’ve entered recently. I’ve entered for every single one of the 25 days of giving as well as several on Mattress Clarity, several individual ones, etc. The main thing that surprises me is that there are so many different types. Well, my last comment stated the Nest Hybrid….however after this Brooklyn bedding review, I have changed my mind. This is my new favorite! :-) Thank you. Love bouncy!! And environmental consciousness is important to me! It would be awesome to win a new bed! Winkbeds is my favorite mattress it’s hard to choose though I love them all. Brooklyn Bedding is amazing! Love their bamboo sheets! I’m another member of the Zenhaven Tribe, but wouldn’t kick any of these mattresses out of bed. I think I like the Bloom Hybrid. I would have to sleep on one for a few nights to pick my fave. Thanks for the chances. O would be so happy with any of them. I really need a new one! Thank you for the opportunity! I know some people post such sad stories just to try and better their odds, that’s not what I’m about to do. This is honesty. I’m a blogger, I have quite a few followers on social media, I’m a product tester, and I’m honest in all of my reviews. The bed I own, its terrible. We can’t afford a new one and I will not purchase a used mattress from any of the local stores here. Winning this would be a blessing for me and I would leave an honest review about your product after a few nights of using it! My fingers are crossed! I would love to win and try out this mattress and share with others!!!! Thanks for the opportunity. I need a new mattress so bad!! So hard to choose 1 they all seem so great!! I think the Leesa! We like the Zenhaven, we are side sleepers and it sounds like it would be great for us. Some of the others sounded great too! Brooklyn Bedding sounds very comfortable and wonderful. But I’ve heard so many great things for so long about Tempur-Pedic, I would have to go with Tempur-Pedic for a brand new mattress! Would love to have an actual bed. So hard to choose just one, as each mattress has many good benefical features for me, but the Zenhaven is my favorite. I just bought one for my daughter. It’d be so wonderfully helpful if I win a new mattress. ZenHaven! Thank you for this amazing opportunity! Happy Holidays! I need a new mattress, would love to win this! The Brooklyn bedding line is supposed to be one of the best. Amazing giveaways! Thanks so much! This Brooklyn Bedding mattress looks awesome! Thank y’all so much for this amazing blessing. My Army Veteran husband and I need a new bed so badly! Good luck everyone! 🍀🍀🤞🏻🤞🏻 Happy Holidays! My favorite latex mattress is the Idle mattress. Great stuff. I love them all. No complaints. The Bloom Hybrid looks awesome, I really like latex and hybrids! HAPPY HOLIDAYS EVERYONE……… THANKS ONCE AGAIN FOR THIS AWESOME BED.. ANY OF THESE WOULD DO GREAT FOR MY SLEEP!!! I love the review of Nest! I’d love to have the Zenhaven! 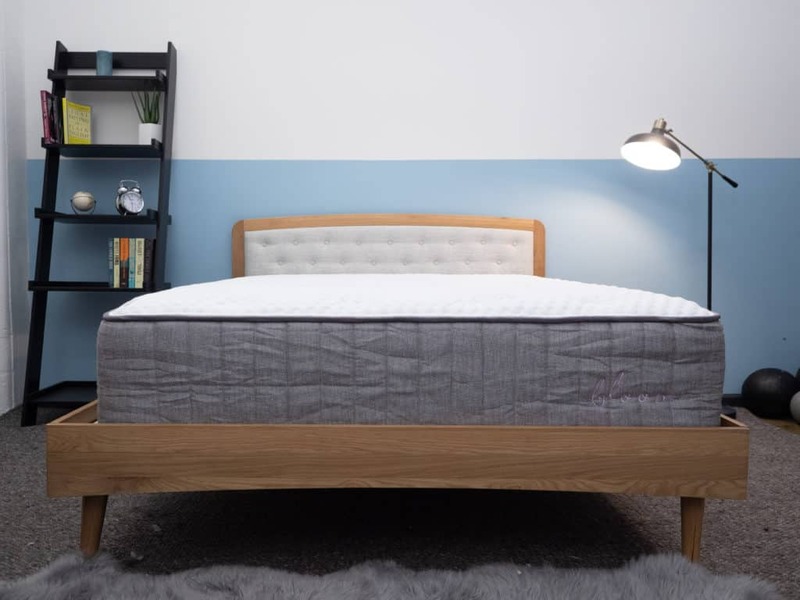 This Brooklyn Bedding Mattress seems like a good one for me a side sleeper. It has foam for the softness I need, plus it’s hybrid design gives good edge support. I would love to have this mattress!! I like Zenhaven. Thanks for this chance. Not only a fabulous-sounding mattress, but Made in USA!!! Would so love to win it in a twin size! Love the pressure relief qualities of this mattress! Could use a new set of mattress. Good luck everyone! Merry Christmas to you all! This Brooklyn bed seems nice and springy. Love that it has wool woven into the cover! The Bloom Hybrid sounds wonderful, especially to be able to try and sleep in different positions on a mattress with proper support. Do like that it’s offered in a soft version too if the medium firm doesn’t work. Love the all natural hybrid design! Seems like a very nice mattress! Thanks for the chance to win it. I love the Leesa mattress! ! I like the Zenhaven and the Purple mattress. I think my new favorite is Allswell. It is really hard to decide, but the amazing reviews help narrow it down for sure. I would love to win this mattress!! Good pressure relief…Love to try! Thanks – I Need A New Bed VERY Much !!!! I’ve been dreaming of a Brooklyn bedding mattress for quite some time! This would make my holiday season wish come true! The review on the Layla looked really great, but then I read the Brooklyn and that sounds great too! Bloom Hybrid is definitely the mattress for me!!! What an amazing giveaway!! Definitely the perfect mattress for anyone- I think it would be good for a family with young kids, for sure!!! 👩‍👦‍👦Especially if you co- sleep with them!! Bloom hybrid & Spartan look wonderful. I’d love to try both. I like the zenhaven best. I am strictly a side sleeper. The Brooklyn Bedding Bloom Hybrid mattress sounds good to me! the Bloom Hybrid, an eco-friendly hybrid model. Wow! Great cushion and at the same time long lasting and comfy! I love it! I would absolutely love this mattress. Awesome that this mattress is made from Natural Latex and has coil. Sure sounds comfy. This sounds like another great mattress! I love that its good for multiple positions and that it helps you sleep cool. Amazing! Looks wonderful. Sure would be nice to win. I know I need a new bed and maybe this would be a way to find out . It would be really great to have one. I am very intrigued by the Zenhaven mattress. I believe the Zenhaven would be the best for me. I pray for Hybrid much needed grateful for opportunity! Something that I am truly in need of! A new mattress!